October | 2012 | 50 Westerns From The 50s. 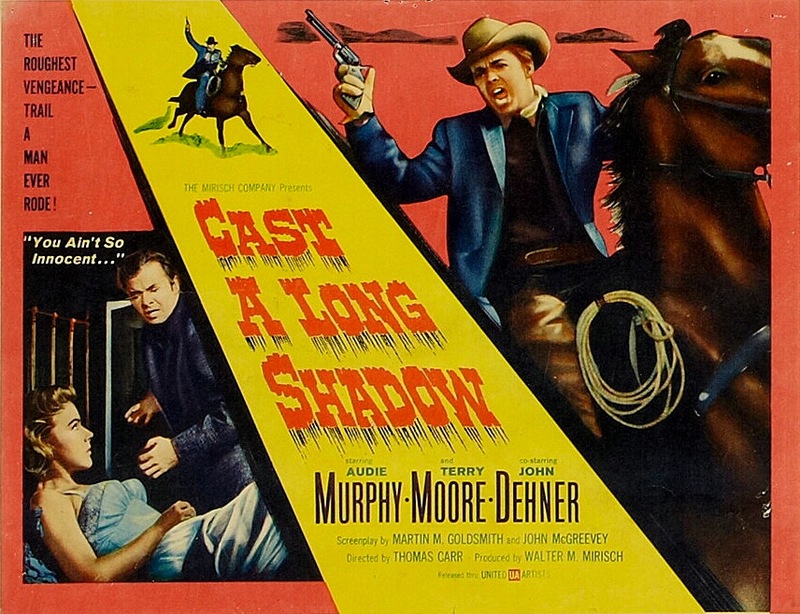 50s Westerns DVD News #102: Cast A Long Shadow (1959). Another Audie Murphy Western coming to DVD is always good news. In January, Cast A Long Shadow (1959) will arrive from Galam (Shout Factory’s parent company). It was directed by Thomas Carr and co-stars Terry Moore, John Dehner, James Best and Denver Pyle. ClassicFlix lists it as widescreen. More info here. 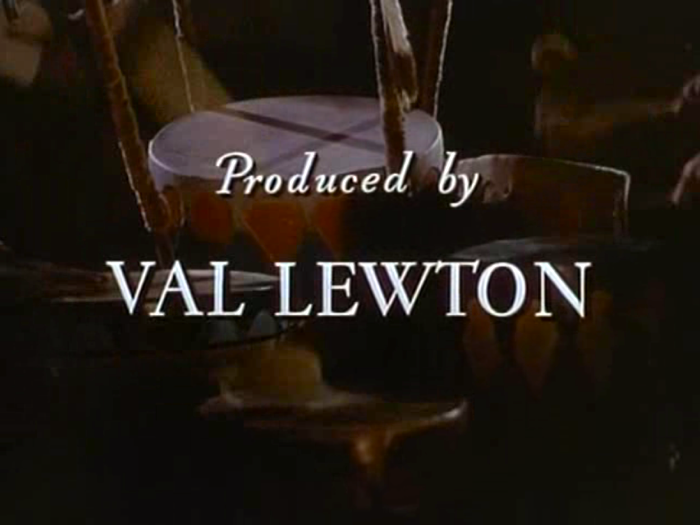 The Val Lewton Blogathon: Apache Drums (1951). CAST: Stephen McNally (Sam Leeds), Coleen Gray (Sally), Willard Parker (Joe Madden), Arthur Shields (Reverend Griffin), James Griffith (Lt. Glidden), Armando Silvestre (Pedro-Peter), Georgia Backus (Mrs. Keon), Clarence Muse (Jehu), Ruthelma Stevens (Betty Careless), James Best (Bert Keon), Chinto Guzman (Chacho), Ray Bennett (Mr. Keon). Happy Halloween. This is my contribution to the Val Lewton Blogathon — a celebration of the life and work of the great producer. Hosted by Stephen aka Classic Movie Man and Kristina of Speakeasy, you can find more posts at either Classic Movie Man’s Lewton page or Speakeasy’s Lewton page — by film bloggers from all over the Intenet. I’m honored to be rubbing cyber-elbows with them. If this is your first stop on the Val Lewton blogathon, you’ve come in at the end of the show. 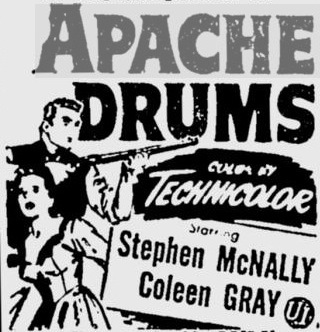 Apache Drums (1951) was producer Lewton’s last film; he died before its release. 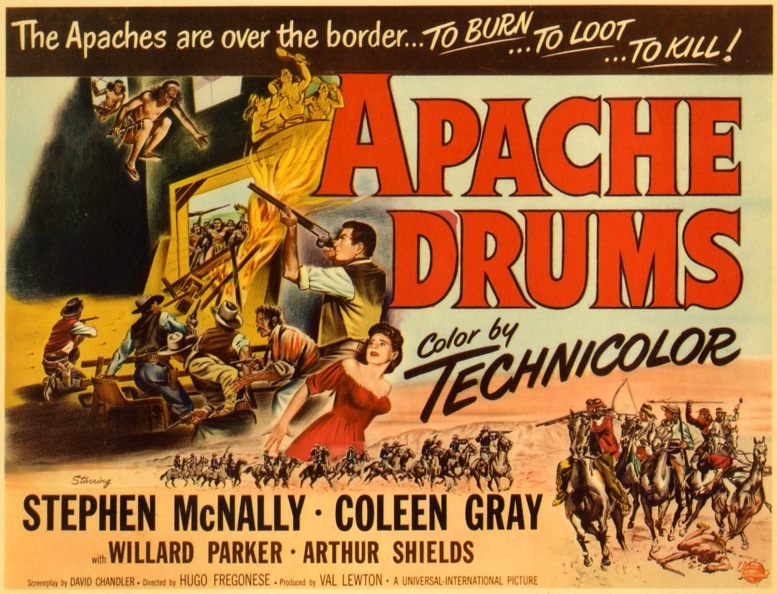 Though this was his only Western, and the only time he would produce a Technicolor film, Apache Drums is very much an extension of his earlier work in horror films. A little backstory is in order. 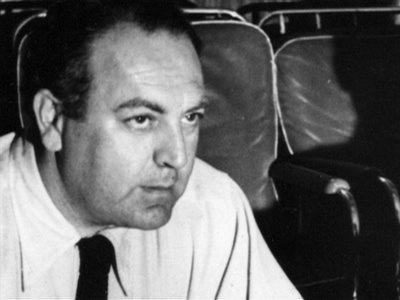 Val Lewton was a novelist who wound up a producer. In the early 40s, he found himself in charge of a small unit at RKO, making horror films for $150,000 each. His psychological approach, preying upon our fear of the dark and the unknown, was both effective (the first, Cat People, grossed millions and helped save the studio) and cost-effective (little light, minimal sets and no monster makeup). Lewton believed it was better to suggest horror than to show it. Leaving RKO in 1946, he made films for Paramount and MGM, and considered starting an independent production company with two of his directors from RKO, Robert Wise and Mark Robson. It fell through. There was talk of an association with Stanley Kramer at Columbia. And there was a producing gig at Universal-International — which resulted in Apache Drums. The town of Spanish Boot is on a mission to make something respectable of itself. So when Sam Leeds (Stephen McNally), a gambler, shoots a man in self defense, he’s run out of town by Mayor Joe Madden (Willard Parker) and Reverend Griffin (Arthur Shields). He’s also forced to leave his girl Sally (Coleen Gray) behind. Leeds rides back to warn the good people of Spanish Boot, but no one will believe him — until a stagecoach shows up with its passengers dead. This sets things in motion, the Apaches comes, and Leeds and the remaining townspeople take refuge in an adobe church, hoping to hold out till the the cavalry can arrive. Filmed under the working title War Dance, Apache Drums was based on a story by Harry Brown, “Stand At Spanish Boot.” I haven’t read it to see how the story was adapted for the screen, but it’s obvious Lewton was able to approach it like his horror films for RKO. Here, the Apaches are the unknown that hides in the dark. Like the people of Spanish Boot, the audience waits in the church, listening to the drums outside, knowing that when the music stops, the siege will begin. Director Hugo Fregonese keeps things moving and the tension mounting. It’s only 75 minutes long. The literate script was by David Chandler, no doubt with plenty of input from Lewton. Chandler later wrote Tomahawk Trail (1957). Cinematographer Charles P. Boyle enjoyed a long career that began in the Silents. His handling of the darker scenes near the end of this film, with lots of Technicolor candles, is very effective, and contributes to the mood Lewton knew was key to the film’s success. 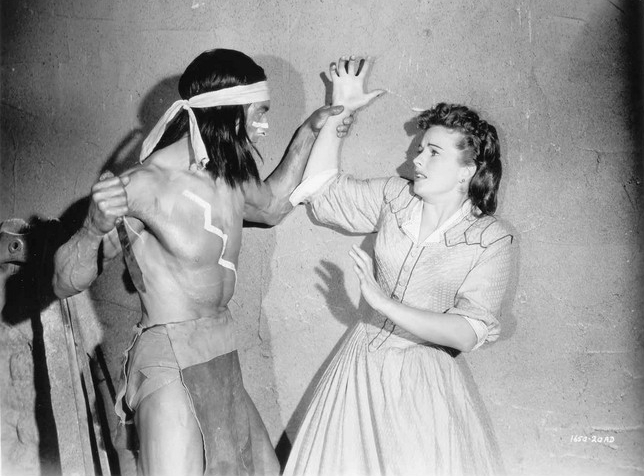 A few years after Apache Drums, Boyle shot the Davy Crockett TV shows for Disney, which were re-edited into the feature Davy Crockett, King Of The Wild Frontier (1955). His last film was Old Yeller (1957). 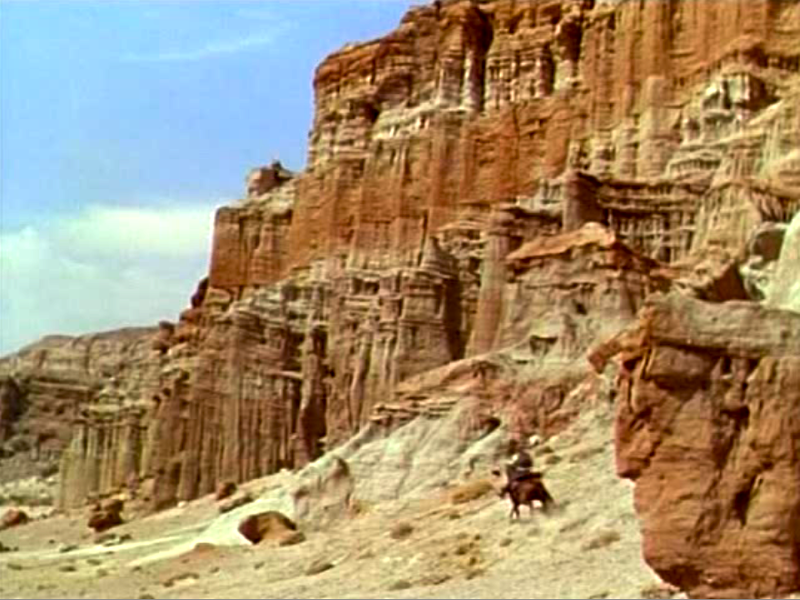 Location shooting was done at Red Rock Canyon State Park, scenes that must’ve been incredible in dye-transfer Technicolor. The Joshua Trees elsewhere are a clear sign of other Mojave Desert locales. (Some sources list Tucson, AZ, and Apple Valley, CA, as other locations.) The expansive, gorgeous outdoor scenes are contrasted by the dark, claustrophobic interiors of the last reel, as the painted warriors leap from the church’s high windows onto the determined settlers below. To help manage costs, the Mescalero Apaches were often played by Los Angeles lifeguards. They were athletic enough for what was required — and cheaper than professional stuntmen. Their presence in the last third of the film is handled largely through sound design — the drums of the title, an effective way to heighten tension while staying within budget. It’s to the credit of everyone involved with Apache Drums that we’re never actually aware we’re watching a low-budget picture. Stephen McNally is quite good as Leeds, a scoundrel we can’t help but like, and who comes to see the error of his ways. As Sally, who also can’t help but like Leeds, Coleen Gray does all she can with a pretty standard part. If she’d had more to do in the final attack in the church, it would’ve made a huge difference. Back to the cast. Willard Parker’s mayor is a bit too stalwart — it’s easy to guess his fate. As the self-righteous reverend, Arthur Shields is, well, Arthur Shields — and that’s a great thing indeed. His character undergoes a real transformation over the course of the film. James Griffith is good, as always, as the wounded cavalry officer barricaded in the church with the townspeople. His knowledge of the Apache informs the audience as we go along. Unfortunately, Clarence Muse has too little screen time as Jehu, the saloon’s piano player. 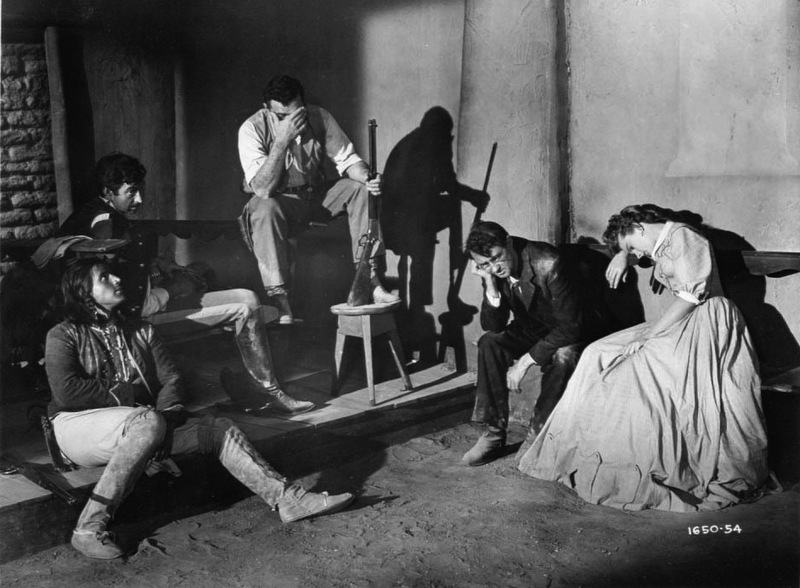 With Apache Drums, Lewton had brought his strengths to another genre and another studio — crafting a tough, atmospheric Western that makes a strength, not a handicap, of its limited budget. After the disappointments of his post-RKO years, it looked like things were getting back on track. But following a couple heart attacks, Val Lewton died on March 14, 1951, at just 46. Apache Drums was released in May. Imagine if he’d continued to work his magic in Universal Westerns for the rest of the decade. An aside: John Carpenter has always claimed his Assault On Precinct 13 (1976) was an homage to Howard Hawks’ Rio Bravo (1959). To me, Carpenter’s taut, suspenseful film seems much more a riff on Apache Drums. I urge you to read Colin’s excellent post on this film at Riding The High Country. 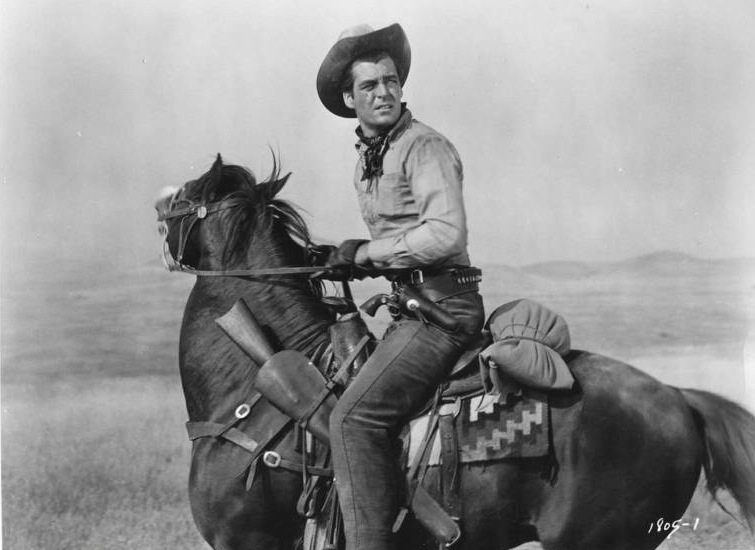 * From Westerns Women: Interviews With 50 Leading Ladies Of Movie And Television Westerns From The 1930s To The 1960s by Boyd Magers. 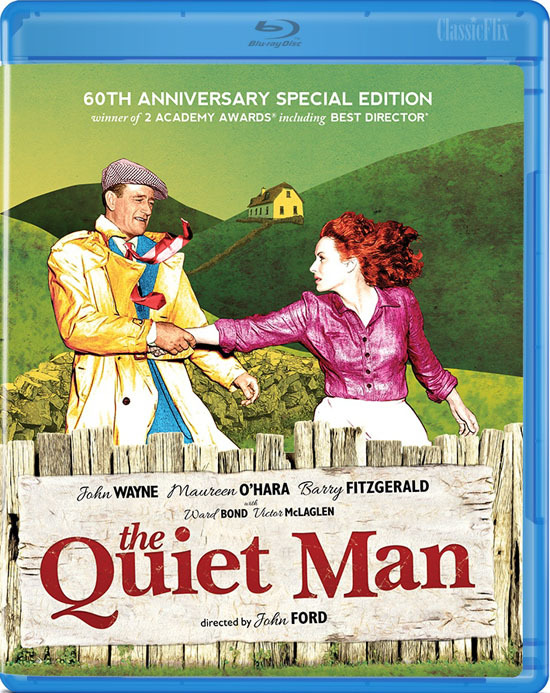 50s Westerns-Related DVD News #101: The Quiet Man (1952). Coming to Blu-ray and DVD from Olive Films, January 22, 2013 — John Ford’s The Quite Man (1952). Suddenly, a lot of people have plans for Saint Patrick’s Day. Yeah, I know, it’s not a Western. 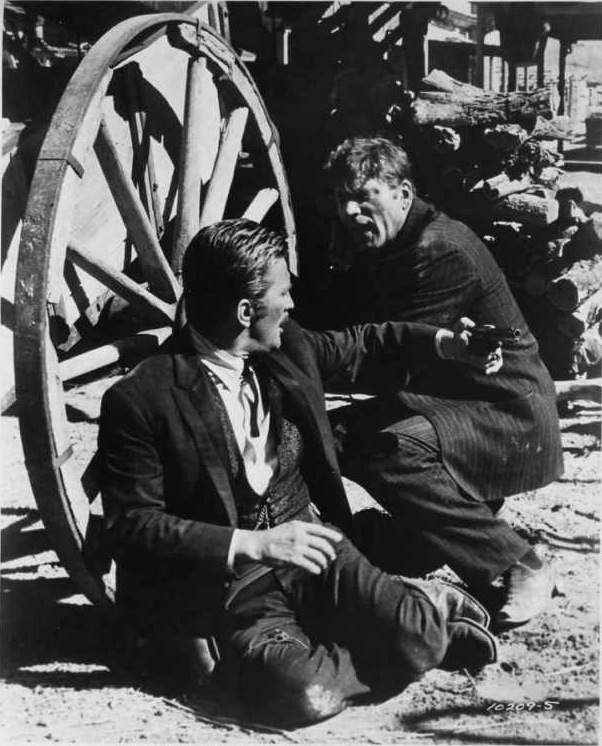 The Real West #7: Gunfight At The O.K. Corral. On this day in 1881, around 3PM, the infamous Gunfight At The O.K. 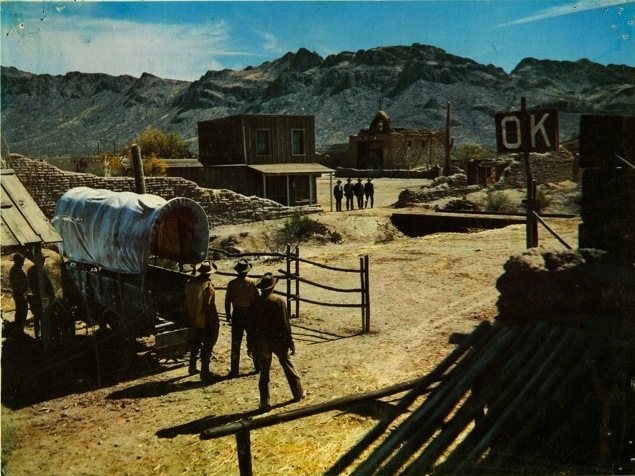 Corral took place in Tombstone, Arizona. It involved Wyatt Earp, his brothers Virgil and Morgan, and Doc Holliday taking on the Clanton-McLaury gang. In a lead-filled 30 seconds, three men (Billy Clanton and the McLaury brothers) were killed. 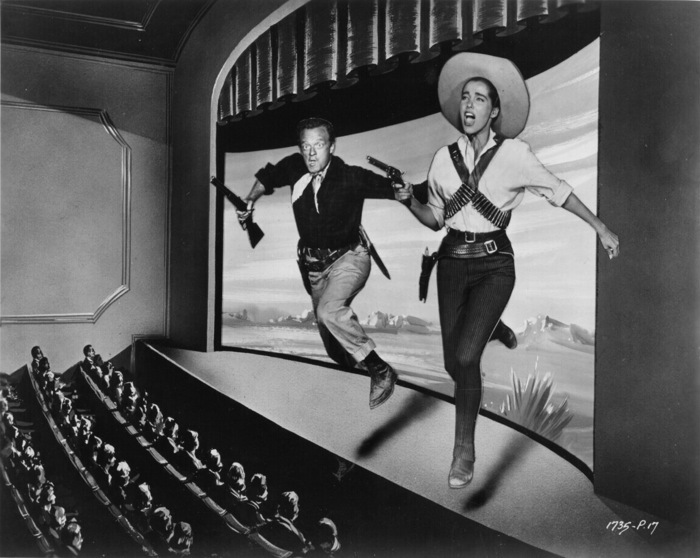 Here’s a couple shots from John Sturges’ 1957 take on the event, Gunfight At The O.K. Corral, starring Kirk Douglas and Burt Lancaster. It’s just one of many films to deal with the shootout, and to theorize on how it actually happened. It’s more likely that they came up with a good action sequence and left it at that. This one gets extra points for the simple fact that Lancaster spends a lot of time running around with a sawed-off shotgun. This seems like a good time to post the lyrics to Gunfight‘s theme song, written by Dimitri Tiomkin and Ned Washington, and sung by Frankie Laine. It’s woven throughout the film very effectively. This Halloween, we can all curl up with our laptops and a plastic pumpkin full of our kids’ candy and make our way through the Val Lewton Blogathon. I’ll be bringing up the rear with a post on the last film Lewton produced (he died at a way-too-young 46), Apache Drums (1951). His only Western, it benefits from all the mood and suspense we know and love from his wonderful horror films. In a lot of ways, it plays more like a horror film than a cowboy picture. 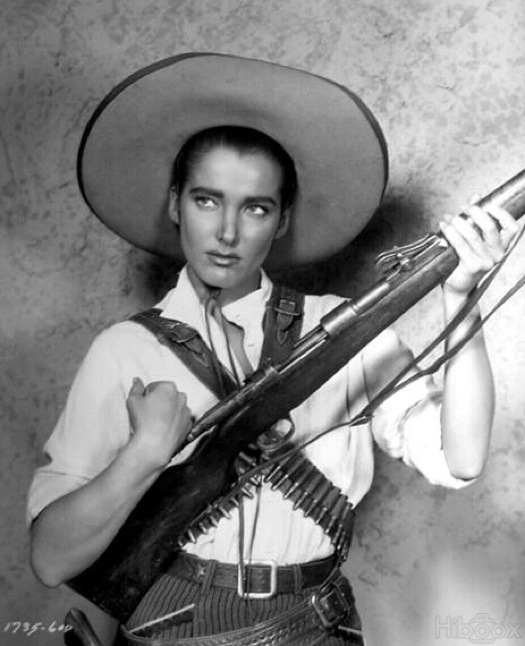 Directed by Hugo Fregonese and starring Stephen McNally, Coleen Gray and Arthur Shields — and with a good part for ace character actor James Griffth — it’s a solid, unique Western with plenty going for it. 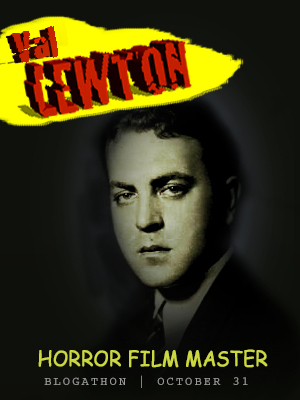 You’ll find further details on the Lewton blogathon, including a lineup of the films and bloggers, here. DVR Alert: Red Sundown (1956). Jack Arnold’s Red Sundown (1956), an excellent Universal Western starring Rory Calhoun, Martha Hyer and Dean Jagger, can be seen on Encore Westerns on October 28. Check your listings, mark your calendar, set your DVR. Thanks to Laura for the tip.